If you’ve ever yearned to recreate the West Hampstead dining experience in your own home, now’s your chance. 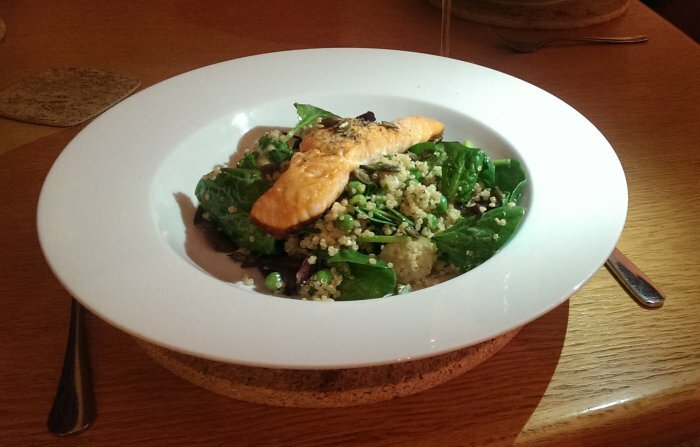 The first in this new series of recipes in association with local restaurants is this deliciously simple salmon salad, courtesy of The Wet Fish Café. We whipped it up in the West Hampstead Life kitchen and it turned out rather well – tender flakes of fish combined with creamy salad leaves, the fresh pop of garden peas, and a crunch and saltiness from the toasted seeds. We found all the ingredients locally, though admittedly we substituted Japanese sesame seeds from Sainsbury’s for the Peruvian sesame seeds stated in the ingredients list and the pink Himalayan salt was just generic sea salt in our version. Why not give it a whirl this weekend, and let us know how you get on! You can use the comments section below (where you can add photos) or tweet your culinary triumph with the hashtag #whampcooks. Pan-fry salmon fillet skin-side down until skin is golden brown, repeat all around (until fish is medium – total of around 12 minutes), leave on the side and keep warm. Cook quinoa according to packet instructions; boil new potatoes. When cool enough to handle, slice the potatoes. Make the dressing: combine all ingredients and whisk well. 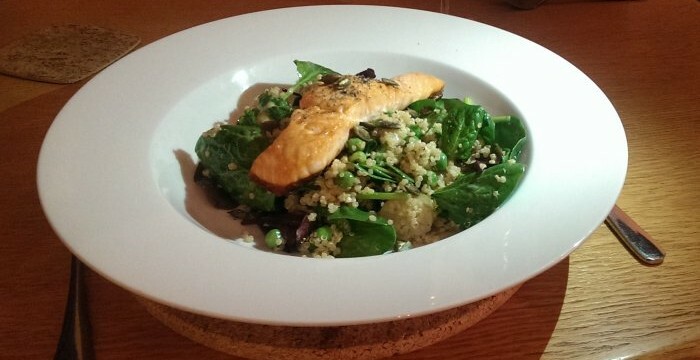 Wash spinach and mix with red chard leaves, add the cooked quinoa, green peas, potatoes and dressing. Place salad on plates with the warm fish on top. Sprinkle with toasted pumpkin and crushed black sesame mix. Squeeze a few drops of lemon juice on top, and your dish is ready to serve!